I’d love to share your testimonials about the progress we’ve made with your pets. Read below to hear from clients what they’ve experienced first-hand! Feel free to leave your reviews on Google Maps or Facebook too. Love it when people want to share their experiences. Christine, we just got home from Padre Island and I have to say thank you again for the great training. Everywhere we went Baron was the star. We went to market days where we were literally mobbed with people wanting to pet him, take pictures of him and ask what he was. Thanks to his training he sat like a gentleman and took it all in stride. Can no wait to get him evaluated and then tested. 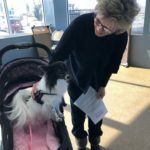 This past summer, Cosette (my Papillon) and I took the pre-test for Pets for Life. We had a few things to work on, but I scheduled our evaluation. Unfortunately, we did not pass. She had never heard the words “sit”” or “down”. I found that very strange, because she is nine years old! We definitely needed some help, so I enrolled in Christine’s class for therapy dogs. It was very helpful. We went over everything needed to pass the evaluation. Our class was all dogs, and it was a great group. I especially enjoyed our last class, which was a field trip to Bass Pro Shop. It was Christmas time and the store was very crowded. It was a good test of how handlers and dogs would react in a public place. The all did wonderful, by the way! Last Thursday we took the pre-test again, and nailed every requirement. We took the evaluation on Saturday, and passed! I just wanted to thank Christine for all of her help. 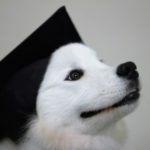 If you are planning on testing for Pets for Life, I highly recommend her class. 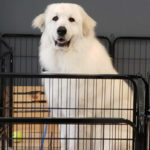 Baron, my almost two-year-old Great Pyrenees and I just finished a pet therapy training class with Christine Evans who owns We Love Pets Training. The six-week class was a small size which gave us plenty of time for individual help if so needed. Baron and I learned to sit by hand command, down, stay, come, leave it and how to get along with other dogs. We can not wait to take the certification test and make other people have a better day. If you are thinking your dog would make a good therapy dog, I would highly recommend Christine Evans as your trainer. Maverick and other dogs provided emotional support for FEMA workers that were being deployed to the east coast to assist people during Hurricane Florence. One man said that he was feeling down and being able to receive comfort from the pet therapy dogs really helped. The people had an opportunity to cuddle and hold the dogs. It is amazing how you can see someone relax when they are holding or petting a therapy dog. One guy came back to Maverick a few times to cuddle with him. I am so grateful that we were able to provide some comfort during a difficult time. Pets are great therapy. If you have a pet that would make a great therapy pet, contact me. Would love to help you both get certified. We live in a crazy world and it is wonderful to see animals comfort people during tough times. 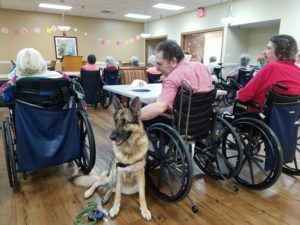 Pet therapy helps people and the dogs. Wanted to give you an update how great “Patience” did with our grandchildren and kids on our trip to Colorado this weekend. We are thankful for the training we received from you. She sat so beautiful and played nice with our 4 year old granddaughters and everyone ages 4- 34. She did chew thru leash and harness on last day there. But no potty accidents at all. Hooray!!! We are staying night tonight in Goodland, KS because my mom was put in hospital, therefore we may miss class tomorrow night, regretfully. Shelbys mom was going to give us her phone number tomorrow night so we could get the dogs together to play. Also we would really like to have further education for Patience as everything you have been working with us on is helping for improvement. We are waiting for making a commitment based on what will be happening with my mom. Thank you Christine for everything! I worked with Tussian and Sullivan who is the new cat in the family. Tussian was having a problem accepting the new cat member in the family. We worked on some training introducing him to Sullivan slowly. Now they are getting along great. Tussian and Sullivan are now coexisting in their home. 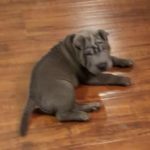 I have had the privilege of working with Sylas, the Shar Pei puppy and his family. Sylas had a lot of puppy energy. We taught him games to expend his energy. He is now playing the find it game for treats, he will crawl, his mom and dad can put a trail of treats in front of him and on his paws and he will not eat them until they tell him it is okay. He is one smart little guy. He was potty trained quicker than normal. We put Sylas on a potty schedule, took him to the same place in the yard each time and praised and rewarded him when he pottied outside. He quickly learned to respond to his name, look at me, sit, being calm in his exercise pen, down, leave it, drop it, walking nicely on the leash and greeting people We are currently working on teaching Sylas to be calm around other dogs. This video shows one of Sylas’ greatest successes. He is able to do a sit, stay and come at a distance. Sylas and his parents are currently in my Pet Therapy class to become a certified pet therapy team. People are going to love them. He has mastered sit, stay and come at a distance. ​​I have been working with a ​​Manchester Terrier named Bailey in Olathe. She is 5 months old. She has so much energy and plays so rough that she was breaking the skin on her mom’s arms. 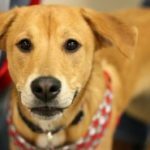 We worked with Bailey and her family on rewarding her when she is calm and when she bites saying “Ouch” in a high pitch and once she stops giving her a chew toy to chew on instead. We have also been working on ways to wear Bailey out. Of course walking and daycare will do the trick, but we have also added giving her a frozen Kong and they are now playing the “Find It Game” with her. They put her in a sit and stay. Then they hide treats around the house and say “Find It”. Bailey love this game. She uses her nose and eyes and finds every single treat. This not only wears her out physically, but also mentally. Bailey is much calmer after these games. Christine with We Love Pets Training has done an amazing job with our new puppy! At just 6 months she knows all of her basic commands and so much more! Our baby is smart, but we would not be where we are with her if it wasn’t for Christine! After researching a number of trainers in the Johnson County area, we decided that Christine was the best fit for our family. Lola loves her and so do we! We are very thankful for her positive training techniques and her willingness to work around our busy schedules to make our new puppy experience a positive one! The next step for Lola is Christine’s Pet Therapy Training. We can’t wait! If you are looking for an amazing, positive, and patient trainer you are looking in the right place with Christine! We would recommend her time and time again! Thank you so much for such a positive and rewarding experience! My puppy learned a lot and so did I. It helped me to understand his behavior. I have noticed improvement in his behavior. Training was easy and instructions were clear. The group was great, the instructor is very experienced and the class was not to crowded. I will be taking the Beyond Doggy Manners class in March. 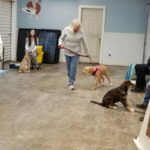 Christine is very knowledgeable about dog training. I liked performing training in a social atmosphere with all the distractions in general. I liked how the instructor related the training to the real world.